Melissa Benn, Danny Dorling, Kayleigh Garthwaite and Owen Jones, Speaking on the future of Social Justice, at the Bristol Festival of Ideas and Policy Press Evening, University of Bristol, December 5th. I want to talk to you tonight about a man who has created a group that published nine Blogs on the housing crisis in the last few months. He named the group “Taxpayers Against Poverty”  as everyone pays taxes and the poor pay most through VAT, and to contrast with “The TaxPayers Alliance” which was created by Mathew Elliot in 2004. Mathew later became Chief Executive Officer of the Brexit Leave campaign. The man I want to talk to you about tonight is Paul Nicolson. 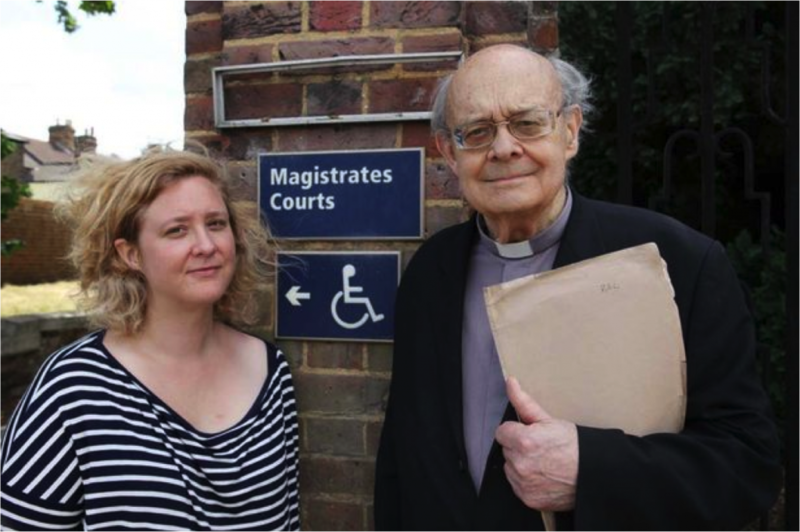 Paul Nicolson, the retired vicar who created Taxpayers Against Poverty is 84 years old . Born on 10th May 1932, for most of his life Paul saw the battle for better housing being won again and again. He was a child in an era when most people rented privately, when most housing was overcrowded, when many people lived in slums and the UK was incredibly economically unequal. In 1937, when Paul was five years old, the best-off 1% of the population, which then included many landlords, took 17% of all national income. Of every six shillings received by anyone earning in the UK, one went to this tiny parasitic group of people, and most of what was left went to those who were almost as well off as them. The vast majority of people in Britain were poor and their greatest expense was the rent. In 1957, when Paul was 25 years old, the best-off 1% only took 9% of all national income. A great transformation had taken place and it had begun before Paul was even born. Rents had been regulated since 1915 and so the takings of landlords fell throughout the 1920s and 1930s. Slums were cleared to the ground and new social housing, and housing with mortgages was built. In 1957 the Conservative Prime Minster, Harold Macmillan would tell people that they had ‘never had it so good’. His administration did build many council houses; but people had never had it so good because they had never been more economically equal, and that was won by rent strikes in Glasgow ushering in that rent regulation in 1915 and then by campaigners winning concession after concession from Conservative and Liberal politicians, then another war, and then a brief but extremely effective Labour government (1945-1950). More and more better quality housing was built as the population grew in number. Most of the rest was greatly renovated. Social security was improved and tenants rights further strengthened. Throughout the 1960s and 1970s people were better housed year after year, overcrowding declined rapidly and housing quality grew. Because rents were so affordable and the rich were controlled, by 1977 (when Paul was 45 years old) the best off took less than 6% of all income in Britain; three times less than when he was born. The lowest they have ever taken. Paul could have expected the situation to become better still. It did in most of the rest of Western Europe in the years that followed, where people are usually better and more affordably housed today than they have ever been before. But it did not get better in Britain. In 1979 a new kind of Conservative government was elected and it tore up the previous protections. Rent regulations were abolished, along with the building of social housing, and a rise in inequality was encouraged. Mrs Thatcher called it “letting tall poppies bloom”. The result was a catastrophe of national and international speculation by the better off, and especially by the very richest 1% who gained the most as most others began to lose out. Housing prices and rent soared. Thatcherism had taken such a hold of the thinking of those at the top that even the election of a Labour government in 1997 did not halt the rise in economic inequality or the deterioration of housing affordability for most people. Those that ran that Labour government no longer understood why rent regulation was needed and why the rich getting ever richer and buying up more and more homes created misery for the majority. The number of people renting privately doubled between 2001 and 2011. New Labour believed that the rich should be rewarded and the poor should be bullied. Sanctioning of the benefits of the poor first rose abruptly under the 1997-2010 government. It was not a real Labour government and although it quietly spent a great deal on renewing some social housing that had been neglected, it did not help make housing more affordable. When it was kicked out of office in 2010 it was because it failed to secure enough support from those it had championed in the past. The 2010 coalition government’s greatest “achievement” was to sanction over one million benefit recipients in 2013. More money was taken from the poorest people in Britain that year through benefit sanctions than all the fines imposed by magistrates and sheriffs courts. A new poor law had been introduced. But still the Labour party did not offer the electorate a change in direction large enough to be worth voting for. The Conservatives won a very narrow working majority in 2015 and quickly set about trying to dismantle the remnants of the welfare state, including affordable housing. They were lead by David and George, people who had been teenagers when Margaret Thatcher became prime minister and who worshiped her as a hero. And they lasted only just over a year in office before Prime minster David Cameron had to resign and his chancellor George Osborne was sacked. Only just over a year when fully ‘in charge’ after waiting half a lifetime to get that power! A great deal has been written about why Cameron lost the Brexit vote on the 23rd June 2016. Just as in the United States in the November 2016 presidential election, it was people from across the income spectrum who voted against business as usual. A majority of leave voters in the UK were middle class and, on average, Trump supporters in the USA were better off than those who did not vote for him. The UK and the USA are the two affluent countries with the worst housing systems in the rich world, in which health is currently deteriorating the most, often largely as a result of housing problems. In both the UK and USA poorer housing and declining health have been linked more closely than any other factor to the political turmoil we are now in. It was the places where the old are suffering more that have voted most for change because they can remember a better past. But neither vote is for a better option. The change in the political mood is remarkable. People have not voted for better options because they were not presented with that choice, but they have voted against carrying on as before and they are now far less predictable in what they might now do. This has shaken politicians who are suddenly enacting U-turn after U-turn, especially when it comes to housing policy in the UK. Three weeks earlier the Conservatives had delayed extending the right to buy to housing associations – another of their previous flagship policies. Ministers gave “Brexit” as the reason, but what they feared for was their own popularity. The public mood was turning against them, and one by one they were unravelling their housing polices. It was housing that government turned to first to try to reduce the anger. Before he gave his autumn statement on November 23rd the new chancellor, Philip Hammond, let it be known that letting agency fees would be banned in England and Wales. Those fees had been successfully banned years earlier in Scotland. When that happened the Conservatives said the idea would not work and that it would harm “the market”. Now they suddenly embraced the idea. Shares in companies that made money charging such fees fell by 6% to 8% on that day because the fees had been being taken largely as profit by the share holders of the letting agencies. The fees were bogus. There are thousands of nasty pieces of law left to fight over. The so-called national living wage will rise to only £7.50 an hour from April 2017, but that is still 4% higher than now. Had corporation tax, not been reduced to 17% that minimum legal wage could have been increased further and faster or benefit cuts could have been reversed. The tide has only just started to turn on housing polices. Families with disabled children are still having their benefits capped at new lower rates so that they will be evicted from what were previously secure tenancies and have to find cheaper insecure private accommodation wherever they can. That is happening now. Councils will still have at their discretion the right to charge higher rents to some tenants; they just no longer have to do that. Insecure tenancy agreements will still be issued in social housing just like private renting, even as government continues to have to be told, again and again, that the beliefs of its ministers and MPs over housing are fundamentally wrong. At least now we know that they do eventually listen. Changes circumstances force in better polices when those are argued for again and again and when the population at large begins to no longer believe their leaders. Paul was born between the wars. He was born at a time of rapid social progress although few people at the time realised this. The progressives fought and agitated for a better world and better countries because they recognized that conditions were so unfair and that change was possible. 84 years on and again with street homelessness rising, evictions rising, millions forced into poverty because of the high rent or high housing prices it is widely accepted that conditions are unfair but it is not yet widely accepted that great change is possible. That does not matter. It can be achieved as it was before: battle-by-battle. Rent regulation, common in Europe and many states of the USA is now urgently needed across the UK. Paul Nicolson has called for a rent freeze in the private sector. We need this while regulation is being introduced, otherwise private landlords will try to push rents up even higher as they begin to realize that regulation is becoming a plausible political option again. It is in the private rented sector that the most urgent actions is required. More social housing is needed, much more than will be provided with that the paltry new funding announced in recent days allows for; but at least we are at a new a beginning. Capital gains tax need to be introduced on privately owned homes to end speculation and it should be set at a much higher levels on second and subsequent homes. Government is going to need greater tax revenue soon. It was right wing governments that raised taxes the most when Paul was young, and in the two decades before he was born – because they had to. We need to aim towards being a country in which people are as well housed as is now common on most of the European mainland. This is not asking for Utopia, it is asking for what already exists elsewhere. This is only possible if income inequalities are reduced. They do not simply fall by themselves and the UK is currently the most economically unequal country in Europe. The best off 10% take 28% of all income, a higher share than in any other European country; and the best-off 1% take half of that 28%! One day we might have a fair land value tax. Good quality housing for all, including well-adapted housing for the millions of us in old age, housing costing less than a third of our daily incomes. Housing we are happy with and that we can see our children starting families in. If all this sounds fanciful it is not more fanciful than imagining, in 1934, that within three decades a prime minster could declare that people in Britain had never had it so good; and then see his party voted out of office a year after he resigned in 1963, for something even better. Private rent regulations were introduced in Britain under the 1915 rent and mortgage restrictions act, which was subsequently and repeatedly strengthened every year as income inequalities also fell from then right through to 1977 when Britain began the most economically equal it has ever been and the take of the 1% was lowest. However the rent act of 1977 was the last act of parliament that limited landlords’ ability to increase rents as they wishes. The Conservative government that came to office in 1979 abolished rent controls in the 1988 Housing Act. Every year after that housing became less and less affordable and income and wealth inequalities in Britain rose. Do not underestimate how quickly things can change. The most important change of all is in what we believe to be right. In late November 2016 a young Labour MP spelt it out ““Why should people in this country work the longest hours in Europe and be paid some of the lowest wages? Why should people not be able to have access to an affordable safe home? Why do we have to wait in long queues in our National Health Service which is increasingly being sold off?”. Clive Lewis explained that politics was not about “left or right” but about “right or wrong”. Change is in the air. Taxpayers Against Poverty recommends a standard of affordability for governments to aim at were a home is affordable when the income remaining after rent, income and council tax have been paid is enough to buy a healthy diet, the fuel to cook it and keep warm, clothes, transport, other necessities, with enough left over for cultural and social participation. This is the standard that was first called for by Seebohm Rowntree in 1901 and which was opposed then by people who did not wish to see inequality fall. There are always people who argue against progress. They failed then, they will fail again, and one day soon we will be able to set our sights higher.